Are you wasting time with prospects who shop you around, fight you on the price, and string you along for a ride just so they can give their business to someone else? A high quality prospect is someone who sees value in your product or service, respects you as an adviser in your field of expertise, is honest and up-front with you about their needs and wants, and will pay the price you ask for your product or service. Below, I present 4 ways to improve the quality of prospects who might be considering doing business with you. "I am satisfied with the quality of opportunities in our sales pipeline." How would you answer the above question for your sales team? You are not clear about what makes an ideal prospect. Your message does not address your ideal prospect and his or her problems, goals and aspirations. You or your sales people are calling unqualified prospects qualified. You are turning qualified prospects into unqualified ones by giving away your expertise, knowledge, energy and time. 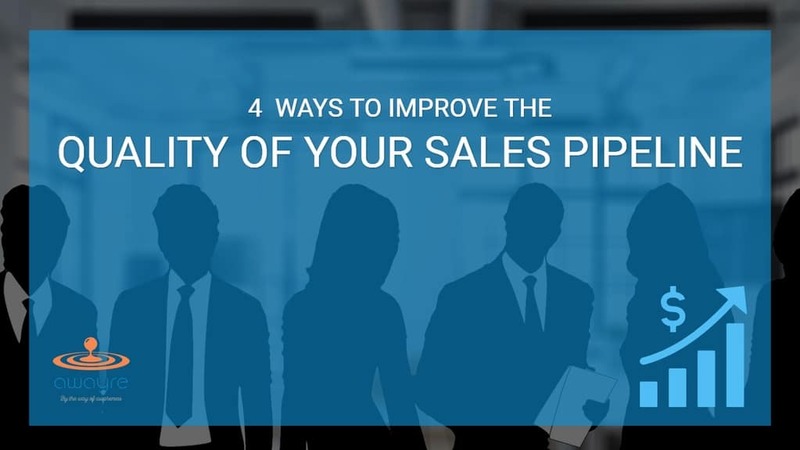 There are four reasons why a company’s opportunity pipeline - a list of business opportunities waiting to be closed - does not have enough quality of prospects in it. And there are four corresponding ways - paths - to fix this problem, once and for all. 1. Get crystal clear about what makes an ideal prospect for you. ​How do you define an ideal prospect? Ask yourself the following questions: Whose problems am I solving? What kinds of business? What kinds of people? Business owners? Presidents? CFOs? CIO? VP’s of Sales? How important is it for these people to solve the particular problems my business addresses? Would they have the authority to spend the money to buy my products or services? Are they the final decision makers? And who else would get involved in making the final decision? True of False? : "​I am satisfied with the ​quality of opportunities in our sales pipeline." This is one issue that trips even the smartest of business owners. The ​message ties everything in your business. This core message - call it a ​story if you like - communicates, in no uncertain terms, what’s in it for your target market to notice your products or services. 3. ​Don't convince yourself that your unqualified prospects are qualified for you to spend time with. ​The question is, if we are clear about what makes an ideal prospect, why would we still call a non-ideal prospect ideal or qualified? Many explanations for this strange phenomenon. But perhaps it all boils down to one term: emotional strength. In other words, we get someone interested in our products and services and it gets us excited - emotionally involved. So we tell ourselves that a prospect is a good prospect even if, in reality, he is not. How would you make sure that your sales people don’t fall for this trap? What kind of communication do you need to have with your salespeople to make sure that they are not painting a rosy picture to you and - more importantly - themselves? "So we tell ourselves that a prospect is a good prospect even if, in reality, he is not." 4. Don't give away your goodies too early in the sales process (and thus downgrade your "qualified" prospects to "unqualified"). ​In the world of selling, where the prospect seemingly have all powers, there is only one power that a salesperson has - ​his expertise. When we give away this power prematurely, at the beginning of a sales-cycle, we lose the only leverage we have with a prospect. This results in those frustrating “We will Think It Over"'s - reducing the salesperson to a “pest” who is endlessly chasing the prospect. In the meantime, the expertise you gave to your prospects gets used by ​her to get a better deal with you competitors. How can you make sure that you don’t give away your expertise to your prospects prematurely? Get crystal clear about what makes an ideal prospects for you. Make sure your message addresses your ideal prospect and her problems, goals, dreams, and aspirations. Don't convince yourself that your unqualified prospects are qualified for you to spend time with. Don't downgrade your "qualified" prospect to "unqualified" by giving away your goodies too early in the sales process. From Amazon: "Neil Rackham and his team studied more than 35,000 sales calls made by 10,000 sales people in 23 countries over 12 years. Their findings revealed that many of the methods developed for selling low-value goods just don't work for major sales. Rackham went on to introduce his SPIN-Selling method." From Amazon: "Solution Selling created new rules for one-to-one selling of hard-to-sell items. The New Solution Selling focuses on streamlining the proven Solution Selling process and quickly differentiating both oneself and one's products from the competition while decreasing the time spent between initial qualifying and a successful, profitable close.